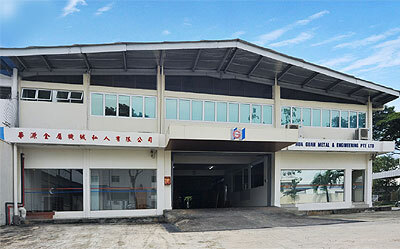 Founded in 1977, Hua Guan Metal & Engineering Pte Ltd is one of the most established stockists in Singapore to supply metal bars and wires to the Precision Engineering Industries.Our products include Stainless Steel, Brass, Aluminium, Free Cutting Steel. Carbon. and Alloy Steel Bars and Wires in various shapes and sizes. After Hua Guan Metal was officially incorporated into a private limited company in 1992, we started the expansion of our business into the overseas markets. Today, we are always seeking for new opportunities to enhance our business activities in the Held of ferrous and non-ferrous metal industries. For more than three decades, Hua Guan Metal has maintained the dedication to help customers in the Asia Pacific region to source for materials that suit their needs and requirements. We work closely with our international principals and suppliers at all times to offer a wide range of quality products to local and overseas customers at a competitive price. Thanks to our customers' support, Hua Guan Metal has grown from strength to strength over the past years. As our management and staff strongly believe in supplying quality products, we strive to improve on our business processes and services so that we can continue to exceed the expectations of our customers in the coming years. "Reaching out to all customers who require our products and services, and be the long-term strategic partner for the Precision Engineering Industries." Bring out the potential of our employees by providing meaningful jobs and advancement opportunities. Engage in value-added activities to enhance shareholder's value. Support our invaluable customers at all times through reliable deliveries quality products and prompt services. Treasure the good working relationships with our suppliers by always keeping mutual interests in mind.